Breaking news for all Bloodborne fans! Shuhei Yoshida, President of Worldwide Studios – Sony Computer Entertainment, has revealed in a tweet alongside Masaaki Yamigawa that Bloodborne will be receiving special DLC treatment later this year via an EXPANSION! We expect to see information nearing Q3, but there’s no information on release date yet. There’s also a new Patch coming out on May 25th, 1.04! Hyping intensifies for fans and for the curious, alongside the endless debate over cut content, rushed products and planned DLC. On this post, however, we would like to focus on what you think the Expansion will be about! What’s your favorite theory? What would you like to see? 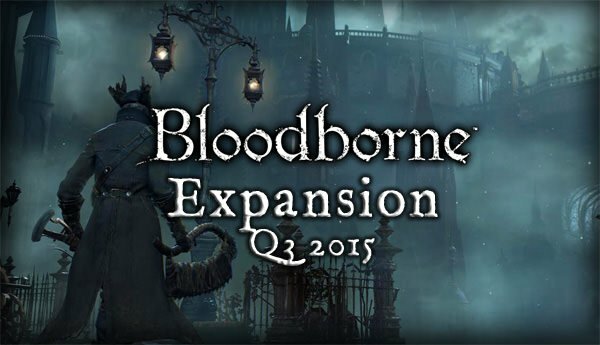 What will the Bloodborne DLC bring? To visit Byrgenwerth and open the mysterious trap door? Or Talk further with Master Willem? To reveal the true meaning of the graves in the Hunter’s Dream? A purpose to the Yharnam Stone and/ or the Ring of Betrothal? Share your theories and check out the DLC Page on the wiki to keep up with news. Yep. I’ve bought all DLC’s from them so far. As long as they keep churning out quality content I’ll keep shelling out cash. Now SHUT UP AND TAKE MY MONEY!!! 1. Its not content withheld from the game, they claim its an expansion like how the shivering isles was an expansion. plus they said we would get info about it later this year that could be in November or December. 2. We got a finished game, Bloodborne feels pretty complete, especially compared to dark souls 2. I mean I am not going to complain because I dont mind extra content. I am happy with the thoughts of new trick weapons that could add some extra variety to builds. If this Expansion comes out a year from know its definitely not some tacked on DLC, now you might have a point if we get it a month or 2 from now but until it comes out you can’t say much of anything. You can’t know with 100% certainty its content that was withheld from us. you dont work for fromsoft and should withhold any bitterness until we get more info. Another thing you dont have to get this expansion, if you dont want it. Yo, this is an expansion. Not DLC. Maybe the lingo for expansions has been misrepresented by other game companies, but FROM Software has a solid history of producing quality content, and I can say without any uncertainty that Bloodborne plays like the full package. We’ve got 2-3 dozen bosses, multiple takes on weaponry, and a stellar game that allows for awesome multiplayer content. "o look moar content has been withheld frum us" is simply NOT TRUE. It really doesn’t feel complete to me though. It feels like a shallow game with tons of chalices tacked on to make it feel longer. The low amount of weapons is also another thing I really dont like, but thats just me. Fromsoft games (AC, Kings Field, etc) are fun partly because of the large expanse of weapons available to you and how you can mismatch your character around. DS2 felt incomplete because it was, and we still had item and weapon movesets (Bone fist, Majestic GS) still in the game files on day 1 release. I’d say Bloodborne is missing things as well, mainly an explaination and use for Beasthood stat other than a small boost in damage, as well as people who can transform/de-transform at will, such as the man in Forbidden Woods. Basically Fromsoft has a habit of with holding gameplay from us and I’m gonna take this news with a grain of salt. I wouldnt doubt if, even after what ENB has told us directly from Fromsoft, there is some kind of hidden thing about Beasthood not released until the expansion. I’d agree if it was coming out tomorrow. But it’s going to be a while before we even get more info let alone see the actual release of it. So for this reason I personally believe it’s something they’re developing now and not something that they removed from the main game. This is the DLC that will feature robots. The next logical step are robots. My money is Dragons. We have not had any dragons in Blodborn, and they appear in every fromsoft game. I don’t recall dragons precisely in Armored Core but they did have Hellkite enemies. This game is different from DeS/DSI/II in that it is more axed toward reflexes, skills and speed. Less, better crafted weapons don’t seem to me like an omission and more like a design choice to fit this type of play (learning the moveset of one particular weapon being central to playing well). As for the beasthood thing… your comment comes of as you taking your expectations way too seriously. I don’t think there will ever be a full on transformation mode. Breaking news for all Bloodborne fans! Shuhei Yoshida, President of Worldwide Studios – Sony Computer Entertainment, has revealed in a tweet alongside Masaaki Yamigawa that Bloodborne will be receiving special DLC treatment later this year via an EXPANSION! Hyping intensifies for fans and for the curious, allongside the endless debate over cut content, rushed products and planned DLC. On this post, however, we would like to focus on what you think the Expansion will be about! What’s your favorite theory? What would you like to see? Quick note that I merged the existing thread and the blog article reply threat to centralize discussion, and added links to OP. Heh. I stand by my previous statements that Bloodborne feels like a complete game, if complete games these days focused more on taking a few tools and polishing them to super-shinyness instead of just throwing everything into the box and sticking it together haphazardly. But I’m not remotely surprised by this turn of events, either. Earlier yesterday I was considering making a thread about some of the old leaked items that weren’t ever found when the game was released but looked an awful lot like DLC keys, but I couldn’t remember if I’d made that thread already and wasn’t sure if anyone cared. I should’ve though, I’d have looked like a god-damned genius. Assuming they weren’t just completely made up by liars and attention seekers, that is. What should I do with level 185? if expansion coming out, I would by now level 200+ …. how I supposed to do co-op with others like this? I am on NG++, this mean expansion also synced to NG++ (that mean I got super hard by triple). "It really doesn’t feel complete to me though. It feels like a shallow game with tons of chalices tacked on to make it feel longer. The low amount of weapons is also another thing I really dont like, but thats just me. Fromsoft games (AC, Kings Field, etc) are fun partly because of the large expanse of weapons available to you and how you can mismatch your character around." "I’d say Bloodborne is missing things as well, mainly an explaination and use for Beasthood stat other than a small boost in damage, as well as people who can transform/de-transform at will, such as the man in Forbidden Woods. there is some kind of hidden thing about Beasthood not released until the expansion. [/quote]"
Our Hunter Transforming completely into a beast wouldn’t make sense in the lore of Bloodborne. Transforming completely is a one way street. Once you go there, you can’t turn back. If it was possible to transform completely, the game might have said "you died" . As well all know, that beast are not rational…Aside from the suspicious beggar in the Forest. He has a interesting story…Perhaps it’s possible to maintain your humanity if turned into a beast after all…? I was always under the impression that our Good Hunter was pretty close to turning into a beast, however. But, that transformation was halted when they receive the blood and contract at the start of the game. Although they remained human, they still had a little "beast" in side of them. Which is why the Beast Blood Pellets affect our Hunter, and why they can ram their hands into a beast’s chest and rip it open with a Visceral Attack. I would even go as far to say that, because of the way they are, they can perform inhuman feats of power and exceed human expectations. Such as killing giant monsters like the Cleric Beast, or the Great Ones. They have the abilities of a beast (such as speed and power), but they have the humanity and brains of a Human. They are like a Hybrid of sorts. But, that’s just my interpretation on the whole thing. I was disappointed that our hunters couldn’t transform completely into a Beast as well. But, when I thought about it, it made more sense that they were not able too. However, From Software could always create a lore point and explain why it is possible, so that they can have it into their gameplay. Cho Cho! All aboard the Hype Train! There was no DLC, Season Pass, expansion announced before the release. In the current state the industry is in, that in itself should demonstrate that there is a very low likely hood that content is being withheld. Secondly they have stated they will talk about it/release it later in the year. Which puts across the impression that it is currently in development and has not already been completed. OT: Title is misleading. There is no "reveal" because there are no details. It is an "announcement", which imo is quite different. Nonetheless I cannot wait! I will be buying it without a doubt. The term expansion (which I hope is used in earnest and not as a replacement for "DLC") gives me great hope as to a really substantial add on. Maybe we will even get a small tease at E3 which would be brill! Later this year sounds lonnng lonnnggggggg.. to long?